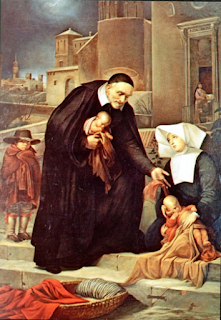 St. Vincent de Paul, co-founder of the Daughters of Charity, was a man of many talents. Talents which have been emulated throughout the past four centuries by organizations around the world. Many of these groups attach Vincent's name to their programs for impoverished people and his name has become a symbol of charitable service and ingenuity. The Daughters of Charity were one of the first three groups who worked under the inspiration of Vincent. The Ladies of Charity began in 1617, the Vincentian priests (the Congregation of the Mission) in 1625, and our sisters (the Daughters of Charity) in 1633. All three groups have remained international and active since their founding. Among his many talents, Vincent was able to draw other people into sharing whatever gifts they had to facilitate programs which assisted desperate populations. Rich ladies gathered up and cared for abandoned infants. Government officials provided access to helping prisoners. Wealthy patrons provided the money to support country ministries and poor country girls served those who were homeless and sick in the city. There was always a balance of Vincent's audacious creativity and the resources he made available through people invited to help make those ideas a reality. The sisters continue to do the direct service so dear to our hearts. However, we also follow Vincent's lead and continually invite others to help make that service possible. Little can be done without the resources, skills, influence, and collaboration that results in both effective service for the immediate problem and the systemic change that prevents or reduces the problem in the future. This "now and later" approach was Vincent's and is now ours. It means, for example, that programs do not just feed the hungry, but offer education or job preparation. It means not only respect for the dignity of each person, but also advocacy for equality in our laws. 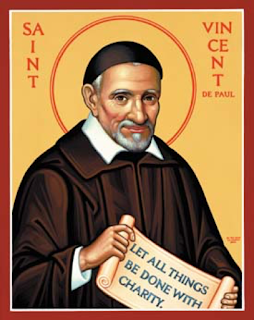 We serve under the banner of St. Vincent de Paul because his example of organized service systems is as important and effective today as it was in 17th century France. Written by Sister Mary Louise Stubbs, D.C.